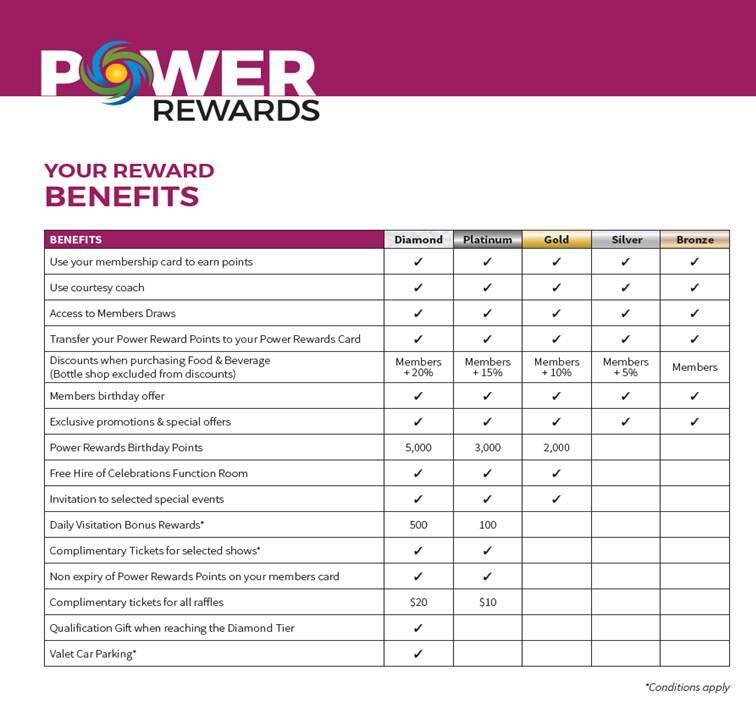 Power Rewards is Club Toukley's RSL's premier loyalty program designed to reward you, our valued members. It is our way of saying thank you for your loyalty with added discounts, special promotions and exclusive services and events. By using your membership card when visiting Club Toukley RSL, you will earn Power Reward Points. The more times you visit and use your card the closer you will get to joining the next tier with even greater benefits. How do I move through the tiers? Q. How do I find out which level I am in? A. Your current level will be displayed whenever you place your membership card into the Gaming Machine console. Q. How do I move to the next level? Q. How do I drop a level? A. Each members eligibility is reviewed on the 1st January and the 1st July each year. Those who do not accumulate the required points in this period will drop to a lower level. Q. How do I spend my points? A. You can spend your points at any point of sale in Club Toukley RSL or use them to purchase vouchers useable at Coles or selected local businesses. Q. Will spending my points affect my level? A. No, tier levels are based on points earned only. Q. How long do my Reward Points stay on my account? A. Power Rewards Points will expire every year on the 1st July with the exception of Platinum and Diamond level members. Q. How do I find out how many points I have? A. You can view you Power Rewards Points balance when your membership card is inserted into the console of a Gaming Machine.